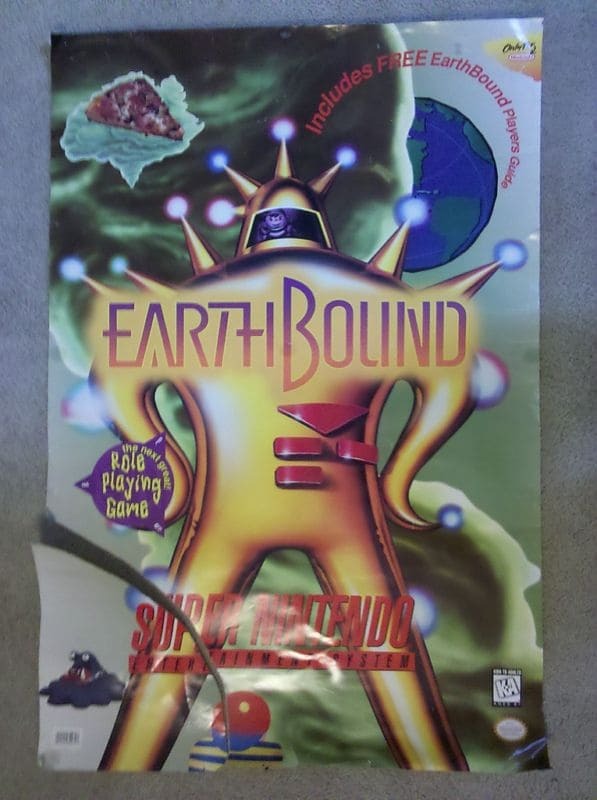 EarthBound posters are very rare, they turn up maybe only once every few years. Apparently one just showed up on eBay today, check it out here! 17 Comments to EarthBound Poster for Sale! Sorry, no way would I spend $81+ on a poster with a huge corner ripped off. Real shame about that tear. There aren’t that many of these bad boys floating around so it’s a real shame when one of them is so badly damaged. I really, really want one of these posters. I wonder if I can get a reprint somewhere though? Hmmm, It is already at $81.00… Who would spend that much even though the corner is ripped off? It’s an extremely rare piece of EB merchandise (the latest one sold for $368!) and it’s easy to just tape the ripped part back together. If I had the cash to spare, I’d definitely try to grab it! I’ve recently thought about selling some of EB swag. My poster is in killer condition. it sold for 371.66 just fyi. zoom!! I finally got my poster!! finally got the link right. check it out for how I framed this poster. I finally got it!! It fits perfectly together,despite that tear. And it was easy to mend with just 4 pieces of small tape. (http://www.haio.com/search.htm) I sold it back in 2006 during a very difficult time in my life and am so happy this seller was able to assist me in getting it back. Earthbound is truly the most brilliant game ever created and I will always be inspired by it. ZOOM!! ZOOM!! ZOOM! !